For a number of years now I’ve specialized in interviews with CEOs from across the energy sector, before audiences, in print and on the air. Doing this onstage is especially satisfying as I have the opportunity to immediately share a conversation with an audience, experience the reaction of onlookers and incorporate their questions and thoughts. In short, it’s always an exciting opportunity. 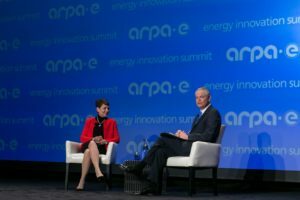 In this instance, I sat down with Lynn Good, the CEO of Duke Energy, one of the largest electric power operators in the U.S., at the 2017 ARPA-E summit outside of Washington. The U.S. Department of Energy’s Advance Research Projects Agency provides funding and expertise to help developers of risky but promising energy technologies bring their innovations to market and transform the ways we produce and use energy.